8th Bn, The Gloucestershire Regiment, 57th Brigade, 19th Division, B.E.F. Previous Employment: Caretaker of the Assembly Rooms, Grange Road, Malvern. Cyril Wilson, the son of Albert and Mary Wilson was born in 1895 at Malvern. In both the 1901 and 1911 Census his father was shown as the caretaker of the Assembly Rooms on Grange Road. The Malvern News reported that he joined a bantam battalion at Worcester in 1915; his medal award information shows that this was the 14th (West of England) Gloucestershire Regiment. This battalion was formed in Bristol for men who would normally have failed the army’s minimum height standard – bantams as they were known. They landed in France in January 1916. 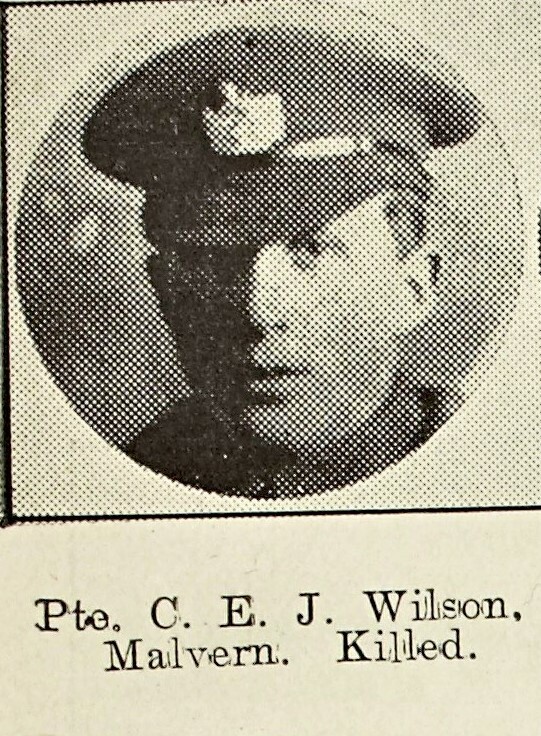 Cyril Wilson was wounded in early Spring 1916 and returned to France on his recovery. He was posted to the 12th Gloucestershire Regiment and finally the 8th Gloucesters. The War Diary recorded the death of two officers and wounding of two others. However the Commonwealth War Graves Commission record that 11 other ranks were killed on that day too. The bodies of the majority of these men were never found or identified and are commemorated on the Ypres (Menin Gate) Memorial in Ieper.